Learning without limits. It's a Trine thing. Location: Athletic, residential, and dining establishments are in close proximity to Trine’s beautifully transformed 450-acre campus. Trine is only 40 minutes from Indiana’s second-largest city and has easy access to major metropolitan areas such as Chicago, Detroit, and Indianapolis via the interstate. Placement rate: Trine students are national leaders in finding work in their majors after graduation, and starting salaries are above average for many. More than 99% of graduates find work or enroll in graduate school within six months. Athletics: Trine offers 32 varsity sports, with 25 competing in NCAA Division III. Many students participate in intramural sports, and Trine’s own Zollner Golf Course, an 18-hole course that served as the site of the 2012 NCAA Division III women’s championships, is available to all students. Scholarships and financial assistance: Trine awarded more than $31 million in institutional aid to students in 2017–2018. Ninety-four percent of students receive some kind of merit- or need-based financial assistance. 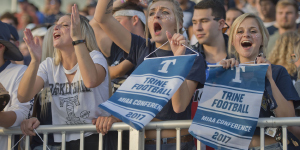 U.S. News & World Report (2018) listed Trine among the finest comprehensive colleges and universities in the Midwest for the 15th consecutive year. 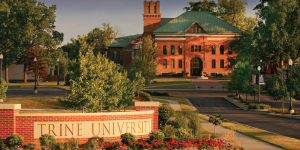 Trine University in Angola, Indiana, is a private coeducational university that grants bachelor’s, master’s, and doctoratal degrees at eight locations across Indiana and Michigan for traditional-aged students and adult learners. Trine provides practical engineering, education, business, health sciences, and liberal arts and sciences programs that focus on work-ready skills and leadership experience. Trine is nationally recognized for its programs in science and engineering. 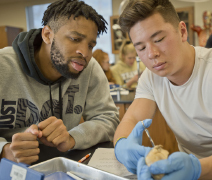 With a student-faculty ratio of 15:1, students benefit from personal attention and mentoring from Trine’s faculty members, who have real-life experience. Students expand their horizons in and out of the classroom through activities from clubs, athletics, and intramural sports to internships, research opportunities, and study abroad programs. More than 99% of students find employment or are in graduate school within six months of graduation. At Trine, the fastest-growing private college in Indiana, growth and change continue on campus. The Jim and Joan Bock Center for Innovation and Biomedical Engineering is home to Trine’s Innovation One (i1), an incubator for technology and businessto help spur economic development in the region, and laboratories stocked with state-of-the-art equipment to support i1 and the Allen School of Engineering and Technology. The Reiners Residence Hall and its new second phase feature private baths, air conditioning, and a common living space and kitchen. The Thunder Ice Arena is home to Trine’s new hockey teams, and the new MTI Center, home to Trine’s basketball teams, includes a fitness center, eSports arena, and six-lane bowling alley. The T. Furth Center for Performing Arts, which houses Trine’s Music program, provides a prominent place for the arts in the lives of residents and students. A theater, health center, bookstore, Whitney Commons dining hall, and Trine’s WEAX radio station keep the atmosphere lively at the Rick L. and Vicki L. James University Center. Student apartment buildings offer private suites and baths; recreation areas and lounges feature fireplaces and big-screen TVs. Campus-wide technology upgrades include an expanded fiber-optic network within a wireless environment and shared multimedia access for teaching in “smart” classrooms. The Keith E. Busse/Steel Dynamics Inc. Athletic and Recreation Center boasts a 200-meter indoor track and tennis courts. Shive Field features artificial turf for football and lacrosse, while practice fields and sidewalks complete Thunder Sports Park. Trine opened the 2015 football season in the Fred Zollner Athletic Stadium, with lights for night games and capacity for 5,000 fans. Trine’s Engineering program underscores the essential skills for finding innovative solutions to complex problems. Trine’s ABET-accredited programs prepare students for rewarding careers in engineering by focusing on the technical, intellectual, and interpersonal skills needed by successful leaders in science and technology. Plus, the program is excellent preparation for a student’s registration as a professional engineer. Trine’s Engineering faculty are active scholars who hold advanced degrees from institutions such as Princeton, Notre Dame, Michigan State, Virginia Polytechnic, and MIT. These instructors embrace the opportunity to help students thrive in small classes by working beside them and getting to know each as individuals. Most students complete internships and research projects, gaining hands-on experience and job skills. As a result, Trine’s Engineering graduates enjoy some of the highest pre-graduation placement rates and entry-level salaries in the nation. More than 98% of Trine’s 2017 Engineering graduates found jobs in their fields or were enrolled in graduate school within six months of graduation. Accredited by the Association of Collegiate Business Schools and Programs, Trine’s Ketner School of Business also offers unique courses of study, including a Golf Management major through its 18-hole Zollner Golf Course. Newly reopened in 2015, Ford Hall is now home to state-of-the-art updated classrooms and learning labs. Designed for the 21st-century business professional, this $6 million renovated building is the new home to the Ketner School of Business. From Criminal Justice and Psychology to English and Mathematics, the Jannen School of Arts and Sciences delivers theoretical knowledge and hands-on training in state-of-the-art classrooms and labs. One-third of the school’s faculty have been nominated by their students to Who’s Who Among America’s Teachers—more than twice the national average. The Franks School of Education prepares bachelor’s degree candidates for careers in elementary, secondary, and special education through programs accredited by the Council for the Accreditation of Educator Preparation. Franks School graduates have had a 100% job placement rate over the past five years. The Rinker-Ross School of Health Sciences offers Biology, Exercise Science, Pre-physical Therapy, and Pre-physician Assistant programs. For information about graduate options, visit trine.edu/dpt. The College of Graduate and Professional Studies, with eight education centers in Indiana and Michigan, grants associate, bachelor’s, and master’s degrees. CGPS offers online classes along with seated classes geared toward working adults’ schedules.